“Living fossil” typically describes a living organism that looks like a fossilized organism but has no close living relatives by evolutionary reckoning. While dinosaurs no longer walk the earth (as far as we know), we can still observe living examples of animals and plants that shared the world with dinosaurs. “Living fossils” pose a conundrum. Why would some creatures remain virtually unchanged from those found in the fossil record, while others changed radically? The answer is easy for creationists. No one has told this allegedly 350-million-year-old fish that it was supposed to have been extinct for 65 or 70 million years, which is why it keeps turning up—and conveniently reminding us of the fallibility of the supposed indisputable science evolutionary paleontologists feed the public. Huntsman spiders have made no evolutionary progress or even any speciation changes since this one managed to get himself entombed. He appears as modern as his descendants. This fact does not surprise us, since we are confident that the amber is no more than a few thousand years old. Creation biologists don’t find the existence of living fossils so mysterious. Far from being an oddity, living fossils are found throughout the fossil layers. Dubbed Protoanguilla palau—meaning “first eel”—this little eel is prompting a redrawing of his family tree. Discovered in western Pacific caves 35 meters deep, the eel seems like a patchwork from the eel time machine. Tropical Huntsman spider trapped in Baltic amber for millions of years? Great sea depths have been hiding an ancient creature. Is it Leviathan? A giant salamander has been discovered in rock layers that evolutionists date at 30 million years. Yet it is virtually identical to giant salamanders living today. Living fossils are found throughout the fossil layers. 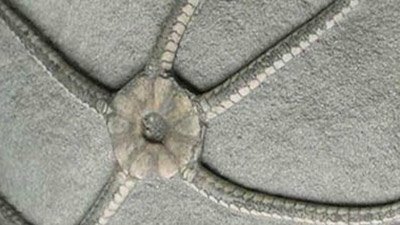 A grape-sized cell inching along the ocean floor may be one of the world’s “oldest” living fossils. The world’s oldest (allegedly) fossilized impression of a flying insect wasn’t found in a rock quarry in an exotic setting; it was found behind a strip mall in suburban Massachusetts. For once, the evolutionists have found something that they believe is too old. A study published in this week’s issue of the science journal Nature describes two recent discoveries of the world’s oldest (allegedly) tree fossils. Australian scientists announced in February the discovery of dozens of fossilized sea turtles that they say have exciting implications for evolution. The botanic gardens in Australia’s national capital, Canberra, has on show a tree which is presently so rare that it is grown in a special cage (pictured, left). The beautifully preserved fossil is of a crinoid, or sea-lily. Most of the public are unaware that there are literally thousands of different types of animals and plants which are alive and essentially unchanged from the way they appear as fossils. Any time someone finds a “living fossil” this supports the creation model by showing that things either have not evolved, or the vast ages are not real—or both. There are literally thousands of different types of animals and plants which are alive and essentially unchanged from the way they appear as fossils. The polistes wasp is one example. It could hardly be more obvious that this shrimp is essentially the same as this fossil shrimp. Yet according to evolutionary theory, they are separated by an alleged 150 million years. There are literally hundreds of different types of animals and plants which are alive and well and which are essentially unchanged from the way they appear as fossils. A rare blind crustacean has been found in Jenolan Caves in New South Wales, Australia. Most of the public are unaware that there are literally hundreds of different types of animals and plants which are alive and which are essentially unchanged from the way they appear as fossils. In Caribbean amber (fossilized tree resin which may contain the bodies of insects), originally lent to the writer for identification of its enclosed insects, an unusual specimen caught his attention.